Our family decided to take a trip to Nantucket to do some surf fishing. Little did we know that we would come back with a Cape Cod fishing story that we would never forget. We awoke to yet another bluebird day, bright sunshine, light winds, not a cloud in the sky, a perfect day for the ferry ride across Nantucket Sound aboard the Grey Lady. Upon arriving on Nantucket, we made our way down the wharf and over to South Beach Street to Affordable Rentals to pick up our Jeep Wrangler, complete with beach permits. We loaded up the Jeep and after some quick beach driving instructions, we were on our way to Great Point and miles of undisturbed, deserted beach! As you reach the entrance to the trail leading out to Great Point, there is a ranger station where you must pay a $25 daily fee. You then reduce the air pressure in your tires to 12-15 psi, perfect for driving on soft sand. Air hoses are provided to refill your tires on the way out. This would be a good time to mention the need for industrial strength insect repellent. We didn’t encounter any bugs on the beach, but as we drove along the inside trail to get to the beach, we were attacked by the most savage mosquitoes we have ever encountered. Thousands of them, swarming the jeep and all of its occupants. As you emerge from the inside trail onto the beach, you can’t believe that you are the only people on this incredible stretch of sand for as far as the eye can see. Immediately the fisherman in me kicks in, as I see some terns looking for bait. We follow the birds down the beach until they begin to dive into the water and my heart begins to pound faster. We jump out of the jeep, grab the fishing rods, and fling the Atom popper into the diving birds. Immediately the bluefish slam the popper and the fight is on! 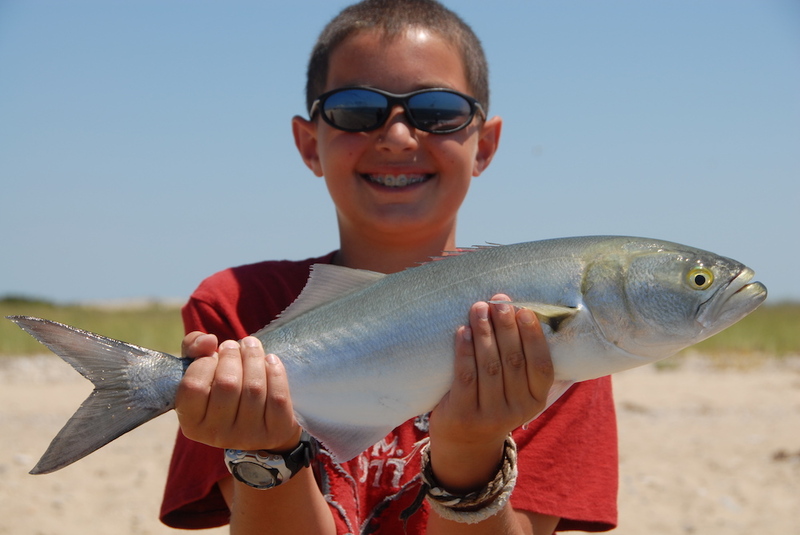 A few minutes later, with his adrenaline reaching an all time high, my son Michael lands a nice bluefish. We take a few photos and release the fish back into the surf. A quick look around reveals that the fish have moved down the beach and are now busting bait a few hundred yards away. Everyone back in the Jeep, and we chase the feeding fish and diving birds towards Great Point. As we reach the feeding frenzy, we jump out of the Jeep and throw the popper into the melee. It is another bluefish and I hand the rod over to Michael. I am watching him fight the fish and with my polarized glasses, and I see this huge mass streaking up the beach just under water. It starts chasing the bluefish all over at unbelievable speeds! The bluefish is literally walking on water trying to get away! Keep in mind, this is only 2 days after they closed the beaches on nearby Marthas Vineyard because of great white shark sightings! The bluefish turns and heads straight towards us in an attempt to get away. It is literally 20 feet in front of us when the huge mass slams into the bluefish making an enormous splash! That’s when I realize that it is a seal! And now he has the bluefish in his mouth and we have a seal on the end of our line! 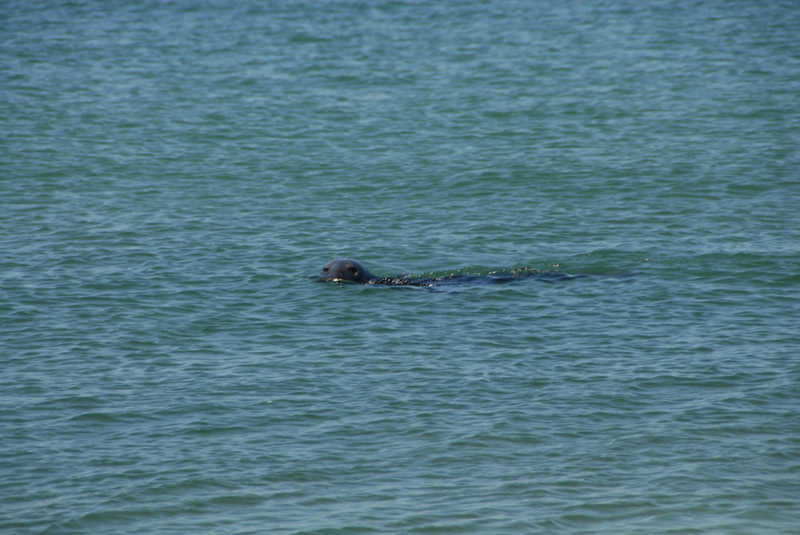 I took the rod from Michael and tried to stop the seal, but it was no use, the seal just swam away taking line. I finally snapped the line to keep from losing it all. I have had fish attacked by sharks, barracuda, but never a seal! I retied using a rattling popper. This time the razor sharp teeth of the bluefish hit the line and cut it. Wouldn’t you know…That seal came flying back down and tracked down the rattle and we watched as he chased that bluefish down. Again the fish was walking on water trying to get away, with our popper in its mouth. When the seal finally caught it…He came up about 15 feet away from us…looked straight at us and shook the fish with the rattle still in its mouth as if to say Ha Ha, mine now! So many times, we talk about the ability of animals, such as whitetail deer, to adapt to their environment. Here is a prime example of adaptability. This seal has learned that it is much easier to catch dinner if a fisherman will slow it down for him. Life is all about creating memories, and on this glorious July day, my family has some wonderful memories to keep with them forever, including an incredible Cape Cod fishing story that I am sure will be told over and over. In true fisherman style, I am sure that both the bluefish and the seal will grow over the years, as my kids tell the ultimate Cape Cod fishing story of the one that got away!